YHM Desert Enforcer, a Magpul-enhanced, Flat Dark Earth warrior in 5.56mm, proves sub-MOA accurate and rock solid in harsh conditions. Yankee Hill Machine’s tank-tough 5.56mm Desert Enforcer, built for optimum reliability in harsh conditions, delivers sub-MOA performance and easily blends into the background in the high desert or dry scrub. 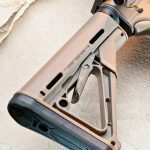 Magpul’s CTR stock is adjustable for six different length-of-pull positions to accomodate shooters of different statures or wearing heavy clothes. (Yankee Hill Machine) – YHM Desert Enforcer 5.56mm, built for optimum reliability in harsh conditions, delivers sub-MOA performance and easily blends into the background in the high desert or dry scrub. 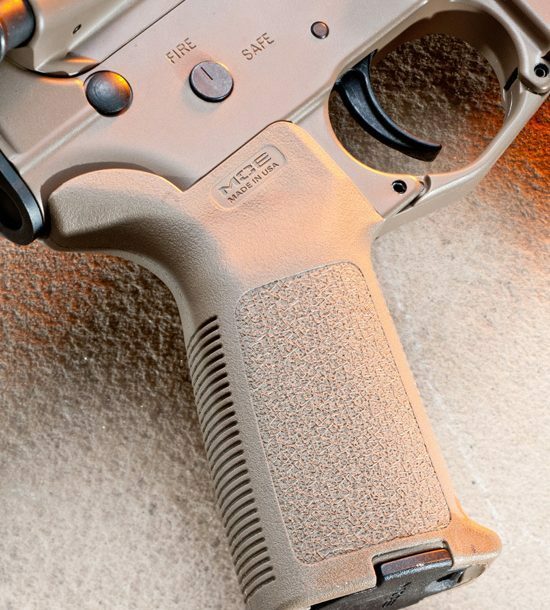 The Desert Enforcer from Yankee Hill Machine (YHM) is finished appropriately enough in a Dark Earth Cerakote, and the smaller moving parts are finished in a standard black for a dramatic contrast. The rifle is a direct-gas-impingement-operated, semi-automatic rifle chambered in 5.56x45mm NATO. 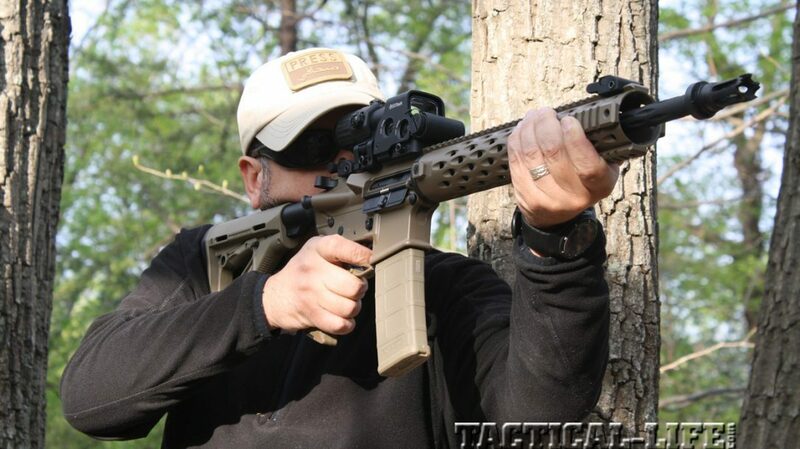 This particular rifle is based on the company’s well-regarded Todd Jarrett Competition Series of ARs, which were developed by YHM in conjunction with world-renowned competitive shooter Todd Jarrett to meet the exceedingly demanding needs of high-speed tactical competitors. 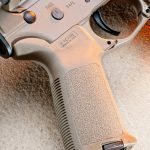 Anyone can get a black rifle in black, but if you really want something more distinct, Cerakoting offers a very popular color choice for ARs. 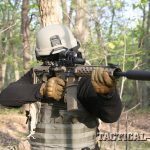 Not having any deserts nearby, I could not independently confirm this rifle’s capabilities of blending into such an environment, but in the full-on-allergy-inducing, bright green Virginia springtime, the rifle proved absolutely capable. 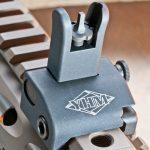 YHM itself is not new to the AR market and was originally established in 1951 by Wallace Judd and James Graham with an emphasis on quality machining. 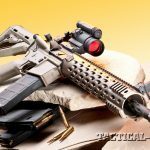 The company is best known today for its extensive line of high-quality AR parts and accessories, including barrels, handguards, suppressors, scope mounts, sights, muzzle brakes and more. 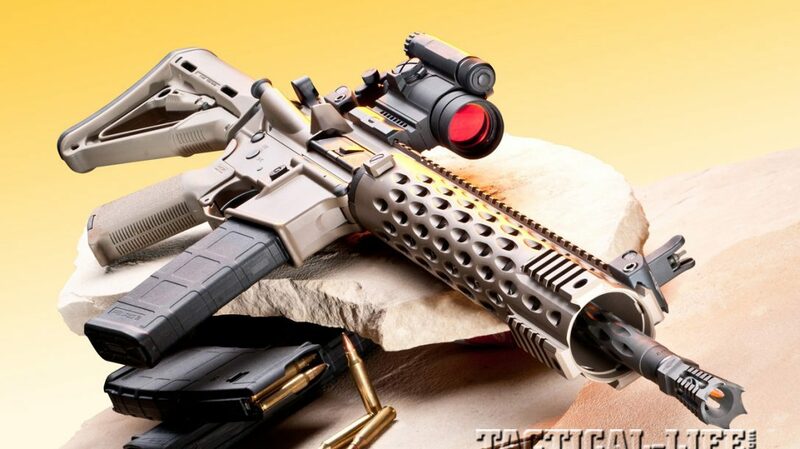 The company also produces a complete line of AR-platform rifles. 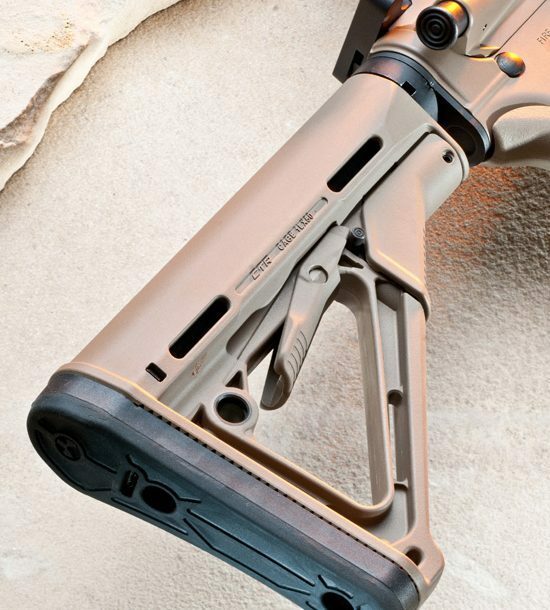 The Desert Enforcer features forged 7075-T6 aluminum, matched upper and lower receivers. The Picatinny rail on the flattop upper receiver meshes cleanly with the top rail on the Todd Jarrett Competition Series rifle-length, free-floated handguard to provide more than 19 inches of space for optics and sights. The controls are all standard AR, with a right-side-mounted forward assist and magazine release, and a left-side-mounted safety selector lever and bolt-hold-open/bolt release. 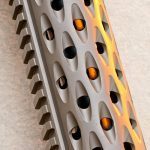 The well-ventilated handguard features a very sleek and smooth design, with 2.5 inches of machined Picatinny rail at the 3, 6 and 9 o’clock positions at the front for mounting accessories such as lights, lasers and bipods. 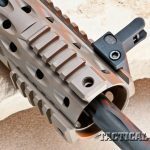 This handguard is a bit narrower and thinner than most handguards out there for improved comfort, especially for those with smaller hands. 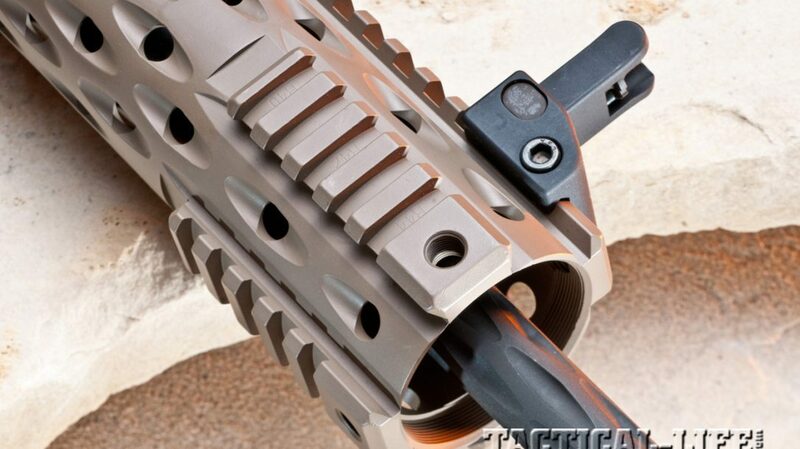 The rear of the handguard features two steel anti-rotation screws for added strength and a secure fit. 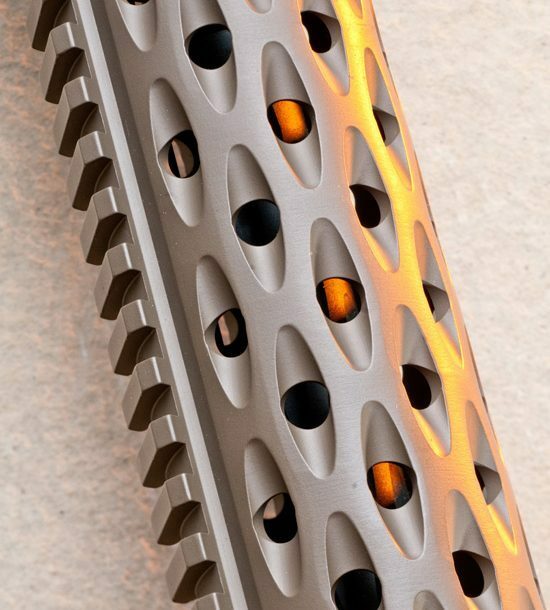 The handguard itself is made from 6061-T6 aluminum and hardcoat anodized to mil-spec. The Enforcer’s 16-inch barrel is made from 4140 steel that has been heat-treated to 25-32 Rockwell hardness, and it features a very distinct diamond-fluted pattern, which aids in heat dissipation by providing a larger surface area and reduces weight while maintaining the barrel’s strength and rigidity. My test Desert Enforcer arrived with a 1-in-9-inch twist rate, but a faster 1-in-7-inch twist rate is also available for heavier bullets. 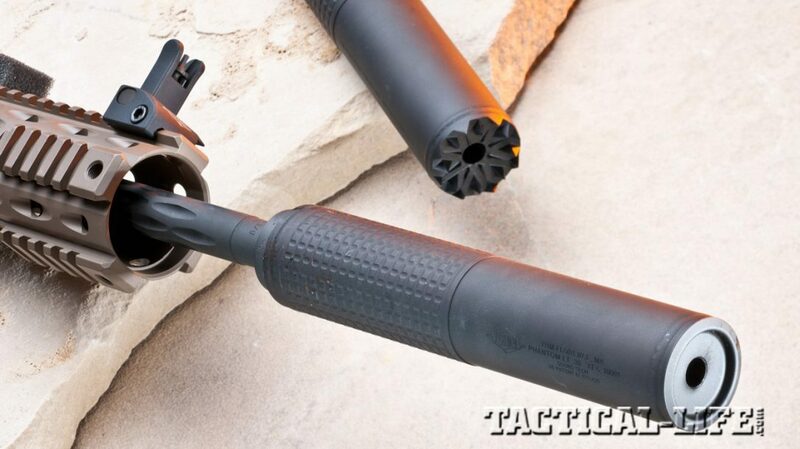 I found that the 1-in-9-inch twist rate—which means that the bullet completes one full rotation for every 9 inches of barrel length, stabilizing a wider range of bullet weights, including very low-weight ammunition—performed very well, yielding some sub-MOA groups. 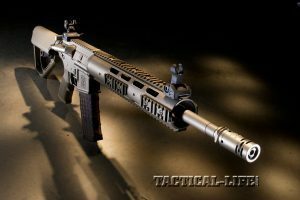 The rifle also has YHM’s Specter XL gas system, where a carbine-length gas system is hidden under a rifle-length handguard. 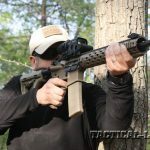 This allows for a truly free-floated barrel with the accompanying increase in accuracy, as the handguard does not make contact with the barrel, meaning no possible distortion is introduced as a result of pressure being applied to the handguard. 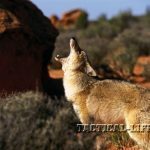 The Desert Enforcer comes with YHM’s popular Annihilator flash suppressor, which reportedly eliminates 99 percent of visible flash and, indeed, on the range I saw none. 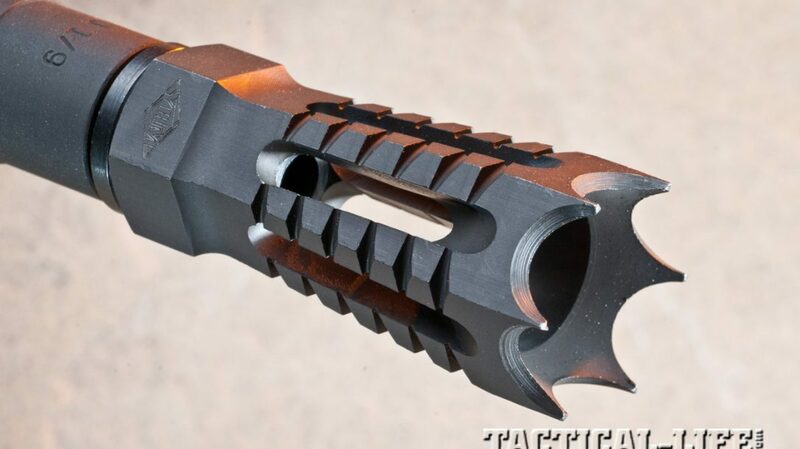 This muzzle device is very aggressive, with several sharp points that can be used as a standoff device as well as for emergency glass breaking. 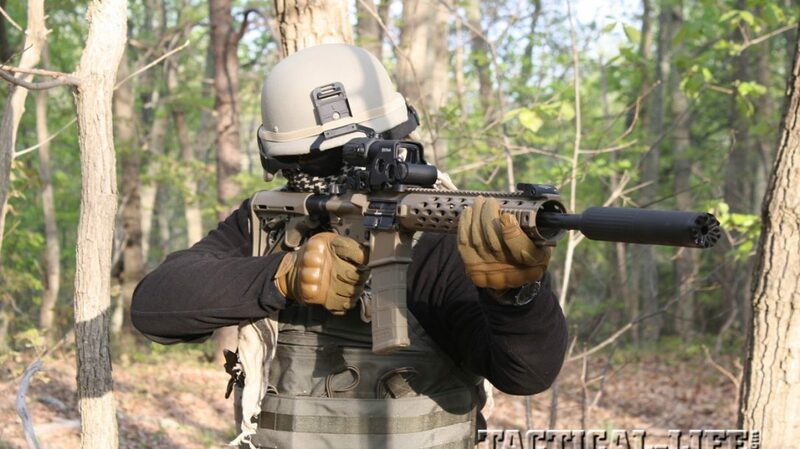 While there is a significant intimidation factor built into this flash suppressor, users should exercise care, as it does have a slight flare and is very sharp, which could cause damage to upholstery, a range bag or a person. 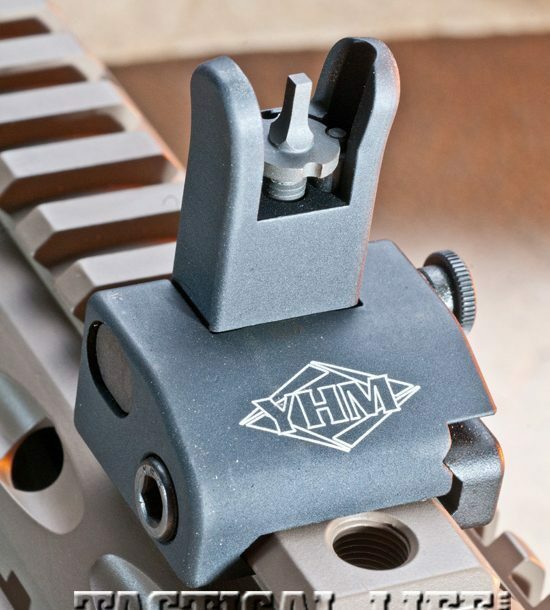 YHM’s Quick Deploy front and rear iron sights, a standard feature for this rifle, are made from aircraft-grade aluminum. They deploy very quickly with a simple quick-deployment push-button release/lock. Both sights have the standard AR peep configuration, and are adjustable for windage and elevation. 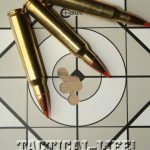 They also lay very flat on the rifle when folded down and, depending on your rings, can be left on and used with optics. 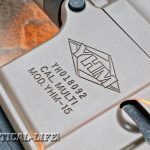 Internally, YHM utilizes all mil-spec parts in its ARs, including using tool steel for bolts and carriers, and M4 feed ramps at the back of the barrel extension. M4 feed ramps are cut wider and lower than on a standard AR rifle, extending past the back of the barrel and into the receiver. 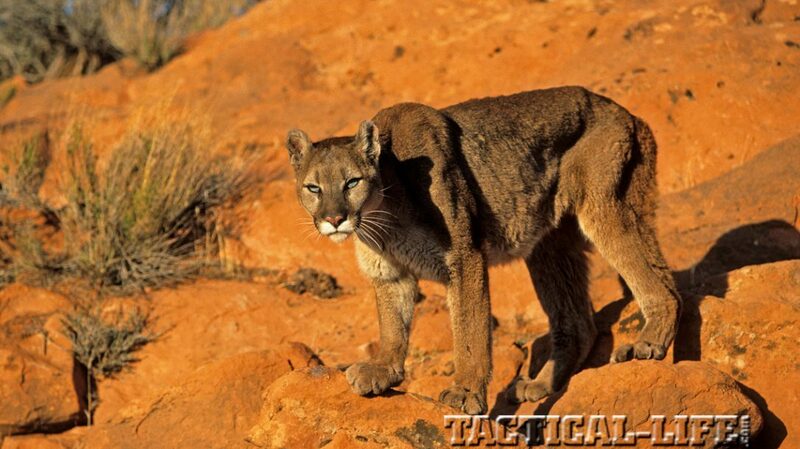 This helps ensure more reliable feeding from the magazine under harsh conditions or during full-auto fire. A proper heavy carbine buffer is also installed inside the buffer tube. Heavier buffers have some distinct advantages. They can be used to slow down the cyclic rate on full-auto guns, making them easier to control. 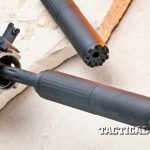 The heavier mass also softens the recoil signature, and slowing down the bolt and bolt carrier travel can also ensure proper case extraction and keep the internal parts from slamming into each other with as much force. A heavier buffer can also make sure that when the bolt goes forward it closes and stays closed, with no carrier bounce. The bolt carrier itself also has a properly staked gas key using Grade 8 hardened fasteners. This is especially important in a rifle that is going to see hard use, as screws that are not properly secured could become loose under fire. Of course, all manufacturers will stake their gas keys in some way, but a sure sign of quality is a properly staked gas key that shows a hammer and punch have been used with enough force to move sufficient metal into the carrier key screws. The trigger is of the standard-issue, mil-spec, single-stage variety, but it feels much better than most I have tried, with only a small amount of creep and a clean break at 7 pounds. In fact, it actually felt lighter than that. 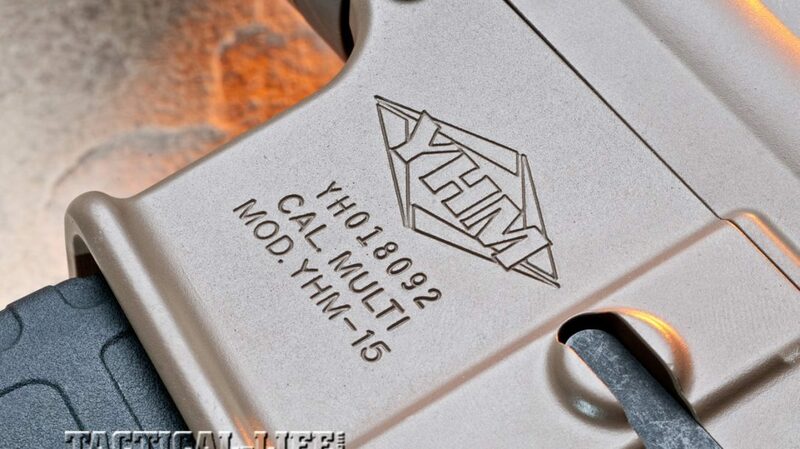 I spoke with YHM, and the company attributes the trigger feel to its high manufacturing tolerances. Indeed, the fit between the upper and lower receivers provided very little play. The rest of the upgraded furniture on the Desert Enforcer is all Magpul, including the Magpul CTR carbine buttstock (on a commercial-sized buffer tube), which can be adjusted for six different length-of-pull positions to accommodate shooters with different statures or those wearing heavier clothing. 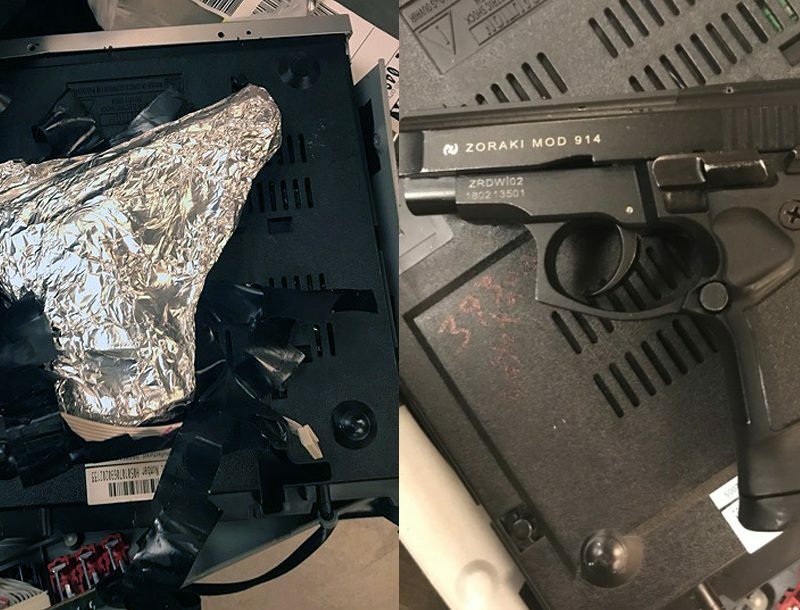 Also included is the Magpul triggerguard, which is enlarged for easier glove use, and the Magpul MOE pistol grip, featuring internal storage space for extra batteries of small spare parts. Both come in Dark Earth. Finally, YHM included a black 30-round Magpul PMAG. 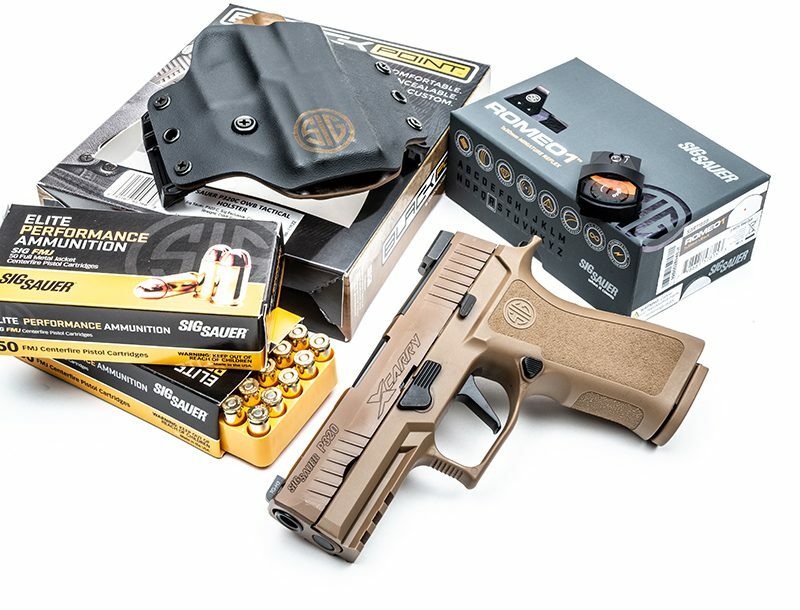 On the range, the YHM Desert Enforcer functioned flawlessly right out of the box using a mix of ammunition with various bullet weights during two days of testing and performing no maintenance. With its short, carbine-length barrel, collapsible stock and unloaded weight of about 6.6 pounds, the rifle was easy and comfortable to handle. feature quick-detach levers for ease of use and installation. The EXPS2 sight features parallax-free optics with 1X magnification and unlimited eye relief. It’s perfect for low-light conditions and super-fast target acquisitions. It is also built tough for field use and will operate in temperatures from -40 to 150 degrees Fahrenheit. 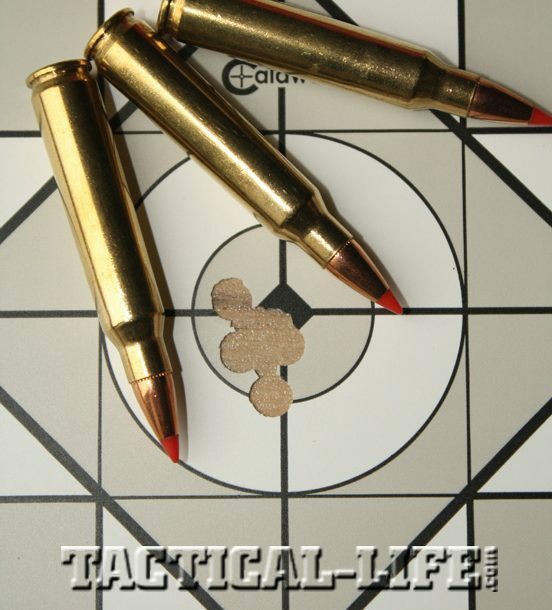 The standard reticle is a 65-MOA circle with a 1-MOA aiming dot, which can be used together for range estimation. The G33 magnifier gives you just enough magnification to make hits out to 600 yards. For accuracy testing, I used the 3-9x40mm Trijicon TR20-2 AccuPoint scope with a mil-dot crosshair reticle and an amber dot. The excellent fiber optics on the scope gather ambient light to illuminate the amber dot in the center of the reticle without batteries. This is a great feature, especially if you’ve gone out into the wild with a red dot or illuminated scope only to find a dead battery. Firing at 100 yards from a benchrest, I found the Desert Enforcer capable of sub-MOA accuracy with the right load. 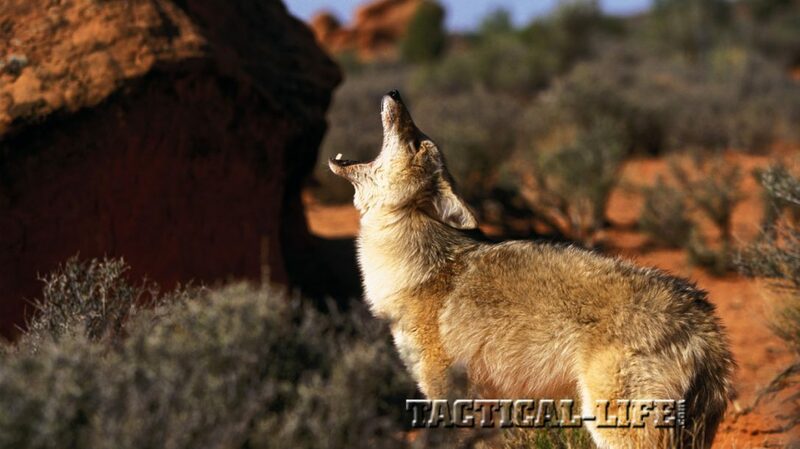 As always, it is imperative to match the ammunition to the rifle for best results. As expected with the lower twist rate, a lighter match-grade bullet—in this case the 60-grain V-MAX from Black Hills—performed the best, yielding two sub-MOA groups, including one of 0.6 inches. 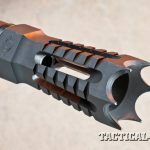 The outstanding Hornady 75-grain BTHP also delivered at least one sub-MOA group and would likely do better with the 1-in-7-inch twist rate option. The Desert Enforcer is a purpose-built rifle delivering serious accuracy and dependability for competition, patrol or sport use. Yankee Hill Machine has spared no effort in manufacturing a very high-quality piece of equipment made to last and stand tough, and the company’s attention to detail and performance is evident in the final product. It may not be the cheapest AR you can buy, but would you really want that when you have to make that one shot to bring home meat for the freezer? For more information, visit yhm.net or call 877-892-6533.